Connect many cameras to your hangout video, and easily switch between them. By switching between different cameras you can teach from different areas of a room. 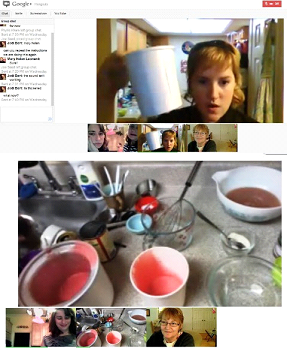 The chefs of ChefHangout typically use two or three cameras in their hangouts. The biggest advantage of using the hangouts with extras is to give the hangout a name or title. Businesses that create public hangouts should consider using this one, unless it is obvious from the presenter’s name what the hangout is about. 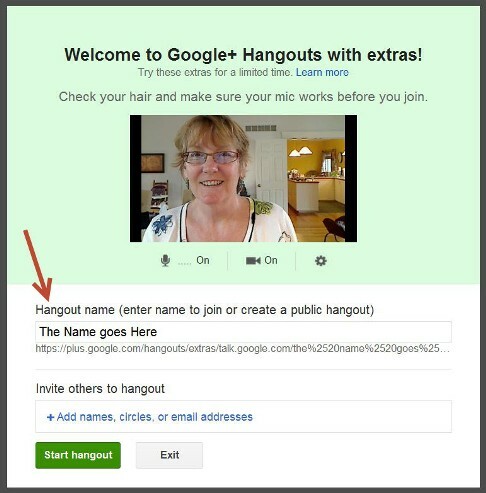 If your Google+ username doesn't describe what the hangout will focus on, use the extras version so you can name the hangout. While Google+ Hangouts allow you to connect with up to nine people, the Hangouts on Air feature lets you live broadcast to an unlimited audience. Once the on-air hangout is completed, it automatically becomes a draft recorded video in your YouTube account where you can edit it and then publish on your YouTube channel, and then of course share it from there. Currently, there is a still a bit of voodoo involved in creating a Hangouts on Air account. It seems you have to know someone, or be at the right place at the right time or be an A-list person who Google seeks out to have this coveted option. Even if you get to use this feature, it is still in beta. “Tech happens” on occasion where you might need to restart the hangout several times to get everything to work properly. I interviewed Candice Hanlon who runs several weekly on-air hangouts including a cooking show, a mommy hangout and interviews with inspiring people. She has a website hub, Hangout Junkie, where you can see the schedule, and you can follow her on Google+ to look for her live hangouts. She said the process to get the on-air status was just happenstance, as she was in another hangout with someone from Google. I’m a bit surprised that Google hasn’t at least created a place to join a waiting list for when it comes out of beta. Once your hangout is over, an automatic post shows all the people who attended the hangout. This on-air feature will be released to the public soon (at least that is what is published on the Google+ site). Once this feature becomes public, I believe you will see a huge increase in the number and types of business-related hangouts. 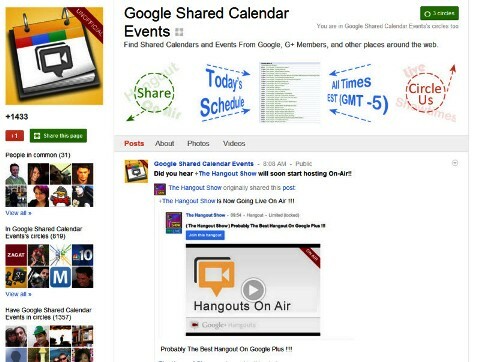 The best way to see who’s using it is to go to the Google+ page “Google Shared Calendar Events” and scan through the posted daily list. You can check this listing daily. Extra design points go to Google Shared Calendar Events for the use of the five images on their page. There are also several Chrome extensions that provide a bigger view of scheduled hangouts. 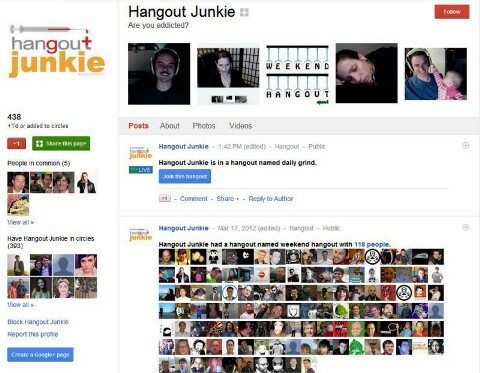 I recommend Hangout Canopy, as it seems to find more active hangouts than Google+ itself. "Hangouts In Real Life" travels to conferences and events and live broadcasts from those locations. Recent SXSW hangout looks like it was a lot of fun! 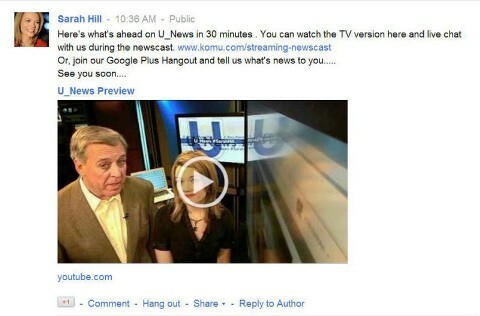 One of the first news stations to use video hangouts as part of its newscast. For your convenience, I have created a Google+ circle with people and pages that routinely hold hangouts. You can access it here. If you are a fan of Twit.tv, Leo Laporte opens up a Google+ live on-air hangout every now and again and invites a group of tech pundits to add to the already streaming (Livestream) show. If you are looking to advertise in this niche, you get so much more exposure with this double interface. Recent photography show on Twit.tv. News stations are soliciting suggestions for news items to report. Sarah Hill at KOMU does this really well. Photographer interviews and training produced by Trey Ratcliff is top in this class. His business model has a nice attraction-based structure that leads people to his iOS app and books and his outstanding photography. 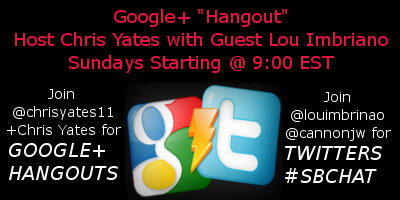 Combine the live on-air hangout with a Twitter chatfor double the fun like Chris Yates is doing. Double technology for wider exposure is gaining more popularity. Coaches and consultants—hangouts with extras allow for you to share document creation and share whiteboard collaboration. Computer technical customer service—hangouts allow you to troubleshoot computer problems while screen-sharing. Virtual assistants—connect with clients from all over the world for weekly meetings and sharing draft versions of content instead of sending in email. There are so many possibilities for businesses and Google+ hangouts. Another way businesses can utilize them is to be a sponsor for some of these events. You could certainly use Google Ripples (as noted in this excellent blog post) to research the viral nature of the business’s hangouts before you contact them. I will really enjoy reading what you suggest in the comments! 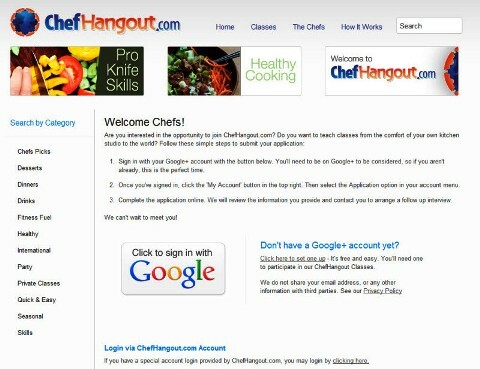 Be sure to check out how ChefHangout is using Google+ hangouts. They are probably the first business of scale using the Google+ Hangout API, launching with two-dozen chefs who utilize hangouts as their sole source of revenue. Applying to be a hangout chef involves a personal interview. 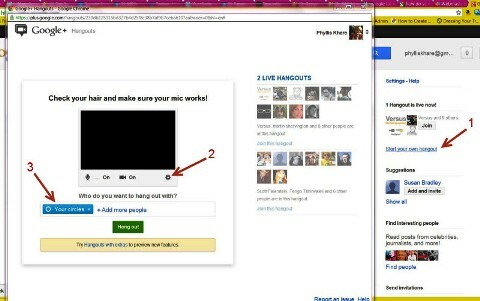 Click the link to “Start your own hangout” in the right column. 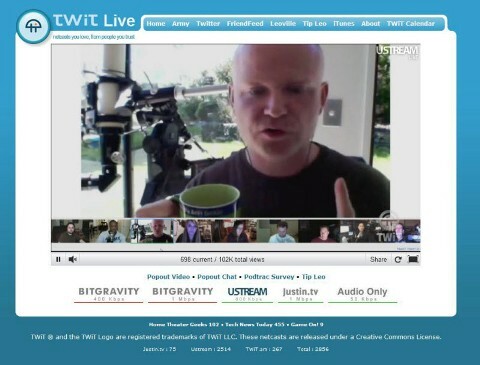 Check in the top right corner and select the personal account or company page you want to use to host this hangout. If you have multiple cameras and microphones connected to your computer, make sure you select the one you prefer to use first. Invite an entire circle, individuals or select Public. The interface to start a hangout has a clean, simple design. Give yourself time to practice. 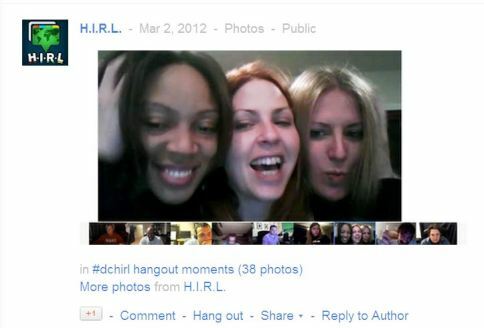 I’m part of a group of women on Google+ who routinely test out new features privately before we open up public hangouts. Create the list of people you want to invite by putting them all in a circle. Then just invite the circle. Create any documents you are going to share ahead of time in Google Docs to easily add them to the hangout. Note: Recently, Google released a new version of their hangout API. So if you are a developer, you can create your own apps built on that API. I can’t wait to see all of the amazing things that will be developed with this video hangout technology. What do you think? I hope you explore all of the links and ideas in this article. I am obviously very excited about businesses using hangouts and I’m looking forward to reading your comments and questions in the box below.